THIS IS AN INITIAL BUILD WHICH MAY NOT BOOT AT ALL. HAVE A BACKUP BEFORE FLASHING THIS AND TRY AT YOUR OWN RISK. Installing a custom ROM on a Galaxy J5 (j5ltexx, j5nltexx, j5lteub, j5ltedx) may require the bootloader to be unlocked, which may VOID your warranty and may delete all your data. Before proceeding further you may consider backup all data on the phone. You are the only person doing changes to your phone and I cannot be held responsible for the mistakes done by you. Download and Copy the GApps and LineageOS 14.1 for Galaxy J5 ROM ZIP to your phone. First flash the Galaxy J5 LineageOS 14.1 ROM ZIP from device. Then flash the GApps zip from your device memory. Reboot and Enjoy the Nougat 7.1 Lineage OS 14.1 ROM for Galaxy J5 (j5ltexx, j5nltexx, j5lteub, j5ltedx). 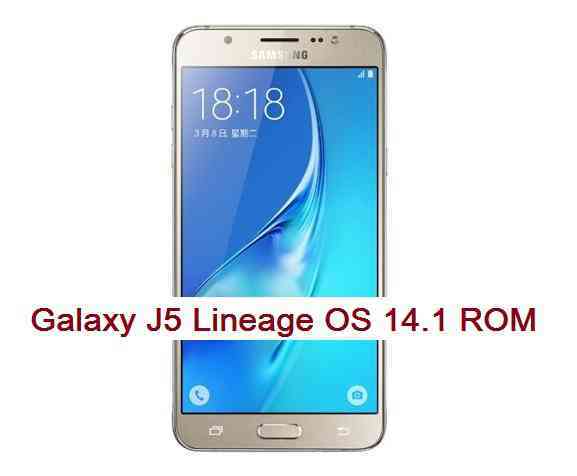 Copy the latest Lineage OS 14.1 for Galaxy J5 ROM ZIP file to your phone. Stay tuned or Subscribe to the Galaxy J5 (j5ltexx, j5nltexx, j5lteub, j5ltedx) forum For other Android Nougat ROMs, LineageOS 14.1 ROMs, other ROMs and all other device specific topics. The dev thread by SoUnd001 is here. Good afternoon, I have a problem with the final result of the migration of my samsun galaxy sm-j500m lte 6.0.1, copying number MMB29M.J500MUBU1BPF3, to lineage 14.1. Put my factory phone and re-passed the original rom, then put the recovery TWRP, enter for recovery and I made the corresponding wipe, then from the external SD in an opportunity “and another time from the memory of the phone” Install the lineage and without restarting you install the gapps, then restart the phone and do not pass the samsung logo and the screen turns green and is illuminating. I would like to know that I am doing wrong or that this is happening to me. Hi jose puello, I am little bit confused. Did the phone boot or did not boot at all?? When I read this “The phone does not have root access when installing lineage and gapps” I thought that the phone booted into Lineage OS 14.1 but there was no SU in the ROM. But when I read the following line: “then restart the phone and do not pass the samsung logo” I thought that the phone did not boot at all to Lineage OS 14.1. If your phone had not booted ever to Lineage OS 14.1 then verify what custom recovery are you using?? Are you using the latest Stock FW, baseband and the Latest TWRP recovery that is placed in the downloads section?? I will try to be as specific and detailed as possible to manage the problem and solution. 1.-Did the phone boot or did not boot at all?? YES, the phone starts, but it stays in the word samsung in black screen and there it is without animation and the screen is illuminated, and it does not continue from that point. 2.-The phone does not have root access when……………..
To this I was referring to the fact that the phone did not have root access when installing LINEAGE 14.1 for recovery. 3.- If the phone booted to Lineage OS 14.1 and there is no SU…..
what custom recovery are you using?? Are you using the latest Stock FW?? the Latest TWRP recovery that is placed in the downloads section?? the latest baseband?? How do I know I have the last?? the TWRP placed en the downloads section Not work for me, because it does not go into recovery mode it stays frozen on black screen with samsung logo. I think it was extensive and I tried not to miss anything, can you help me with this data? What do you think I’m doing wrong? Note: I read in an external post to this page that should be done from lollipot and you have to put a patch, but since they do not talk about that and this is the official page so I ask the question. I think this is the patch that you need to flash after flashing the Lineage OS 14.1. Let me know if you get this ROM booting. A previous Lineage 14 running over marshmallow firmware. Hello! I have marshallow in my phone, after install the rom in twrp, i reboot the phone and the logo screen is starting discolor and lining (look like broken screen). Anyone know what is the problem? link del modelo J500M borrado podrian realzar? que version de TWRP USAS?